This spring, I harvested our first asparagus spears. I first planted 5 bare root Mary Washington asparagus near the edge of one of our raised beds 3 years ago. I planted them about 12 inches apart, but they are not near other plants that would crowd or shade them. I let the asparagus grow without harvesting the spears for the first two seasons, as many publications on asparagus recommend. This year is the first year they have produced more than a few spears that are worthy of eating. I have cut about 15-20 spears in the past month. The spears first starting appearing in our garden in early March. I have let a few spears on each plant grow into ferns so that each plant is able to produce at least some sugar for the roots. I will probably continue to harvest some of the spears for a few more weeks before letting them all grow into ferns. Once asparagus spears grow into ferns, they can become an annoyance as they often fall over into other plants or in a garden pathway. When they fall over, I usually trim the ferns back to keep them out of the way. I have never fertilized our asparagus. 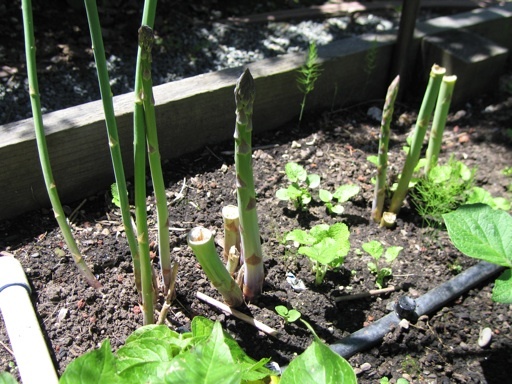 Because they are growing in a raised bed filled in with compost, I don’t think they need fertilizer, especially because asparagus are long-lived perennials that have many years to grow into maturity. Although, I do water them every few days during our spring-to-fall dry season.